Tanzanite is so incredibly rare that experts believe the world’s entire supply of it will be depleted within the next 10 to 15 years. That’s because the world’s entire supply of it exists in a single patch of earth, measuring approximately 4 square kilometers. It is found only in Northern Tanzania in the foothills of Mount Kilimanjaro. Furthermore, the conditions that created the deposit of rare stone on the foot of that great volcano are so geologically unique, most geologists agree the odds of another batch being created aren’t hopeful: about a million to one. Along with only two other freestanding volcanic peaks, Mount Kilimanjaro was formed by massive tectonic activity that created one of the most mineral-rich places on earth: the Mozambique Orogenic Belt. Tanzanite is just one of the many gemstone deposits that resulted from all the folding and faulting that took place there millions of years ago. A relatively young discovery, This stone was first found in 1967 by an Indian prospector, Manuel de Souza. He first thought the bluish-purple crystals were olivine, but soon realized they were not. After a series of misidentifications by Souza and others, the gem was finally correctly identified as a variety of the mineral zoisite. 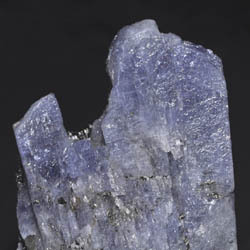 Officially called "blue zoisite," the gem was named Tanzanite by Tiffany & Co. Fearing the word “zoisite” sounded too much like “suicide” to carry much market appeal, they renamed the stone after Tanzania, whence it came. In its rough state, it is usually a reddish brown color, but it is known and coveted for its remarkable pleochroism (that is, its ability to appear different colors when observed or lighted from different angles). The three colors these chameleon stones usually display are blue, violet and a salmon-orange hue. Other colors may be faintly visible in the corners. Smaller tanzanite stones tend to appear more lavender, while those over 5 carats exhibit a rich hue that is most coveted. This gem owes it popularity to their blue-violet color, the stones are heated to 500°F to eliminate the brown-orange color. Unlike other stones such as sapphires and rubies, which are heated to enhance their clarity, tanzanite is heated only to bring out its color, not to create higher quality. Mining of this precious stone was nationalized in the early 1970’s. The industry now brings the Tanzanian government approximately $20 million (USD) net annually. Finished gems are sold mostly in the United States, their sales totaling approximately $500 million each year.